You have recently received several applications from Michigan brewers for permission to qualify as industrial distilleries, their purpose being to brew beer of the customary alcoholic content, extract the alcohol by distillation, and sell the resulting product as near-beer. This procedure is prevented by the regulation which prohibits the use in industrial distilleries of grain other than corn of a quality inferior to Federal Grade No. 6 (Treasury Decision 2642), and I understand you have requested the opinion of the Food Administration in regard to a modification of this regulation. 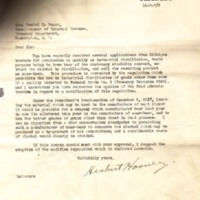 Under the President’s Proclamation of December 8, 19187, limiting the material which may be used in the manufacture of malt liquor it would be possible for a company which manufactured beer last year to use its allotment this year in the manufacture of near-beer, and to use the better grades of grain other than wheat in that process. I see no objection from a food conservation standpoint to permitting such a manufacturer of near-beer to conserve the alcohol which may be produced as a by-product of his manufacture; and a considerable waste of alcohol would clearly be avoided. If this course should meet with your approval, I suggest the adoption of the modified regulation which is enclosed herewith. Hoover, Herbert, 1874-1964, “Herbert Hoover to Daniel C. Roper,” 1918 May 14, WWP19416, Hoover Institute at Stanford University Collection, Woodrow Wilson Presidential Library & Museum, Staunton, Virginia.